Your business operations require a powerful, scalable platform for enterprise resource planning (ERP), supply chain management (SCM), or customer relationship management (CRM) to run. Your CEO requires the ability to manipulate, extract, and analyze large volumes of live transactional data all in real time without impact to business operations. Supermicro is here to help. 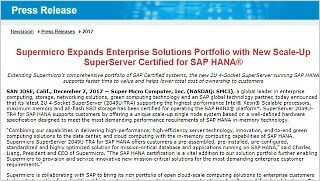 Supermicro has pre-validated, cost optimized, and bundled SAP S/4 HANA into easy-to-understand & simple-to-deploy, fixed-BOM Appliances or customized Tailored Datacenter Integration (TDI) solutions. 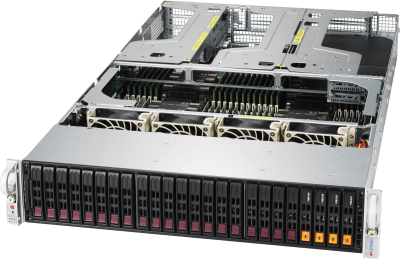 Our latest 2U, 4-Way (2049U-TR4) and 7U, 8-Way (7089P-TR4T) SuperServers support the highest-performance Intel® Xeon® Scalable processors, the largest memory capacity, the latest in as Intel® Optane™ DC persistent memory technology, and fastest all-flash NVMe or SSD storage options available for the SAP HANA® platform. Supermicro SAP HANA certified appliances offer customers a pre-assembled, pre-installed, pre-configured, standardized and highly optimized solution for mission-critical HANA database and applications, including SAP NetWeaver® Business Warehouse and SAP Business Suite on corresponding Supermicro NetWeaver certified platforms. The SAP HANA Tailored Datacenter Integration (TDI) solution offers you more flexibility and freedom of choice to configure the SAP HANA hardware depending on your existing data center infrastructure & hardware. This option enables a reduction in acquisition and operational costs by allowing you to easily integrate new hardware with existing systems, software, and operational processes as long as they are listed on SAP’s Certified and Supported SAP HANA Hardware Directory.